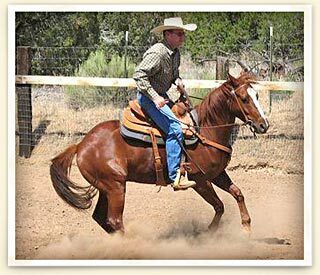 Matt Sheridan is a fifth generation horseman who for the past 30 years has successfully trained and shown horses in a variety of breeds and events. Matt is keenly interested in advancing others’ knowledge of horses and horsemanship through clinics, training and lessons. His focus is teaching others to have responsive horses that move well beyond the basics of the present horsemanship movement. Matt uses his horses to help others see what they can achieve through practical applications to riding. Having a diverse background growing up riding cutting, team penning and roping horses as a youth to training ranch and wild horses in Nevada as an adult, Matt has developed his own unique approach to horses and people. He believes that riding should not be a complex set of rules but a pattern of good guidelines. In other words, the emphasis is on being consistent with ones horse in order to educate the animal. This concept also holds true with people. After working with some of the industries top trainers and from years of experience, Matt has come up with a variety of training clinics geared towards many different riding styles and ability levels. He likes to think of his brand of horsemanship as “Practical Horsemanship”, that which can be put into practice on a daily basis. It does not matter if you are a weekend rider or working for a big ranch. The principles are the same. What makes a great horse is foundation, fundamentals and follow through. He calls these the 3 F’s. Matt puts the emphasis on the first two “F’s”, the third reflects the practice. Training should be goal oriented, much like any formal education. As your trainer and teacher, Matt will provide you with a road map to success. In 2007, Matt decided to introduce riders to his latest approach to riding which he calls Five Steps to Better Body Control. He has found that riders at all levels are experiencing success with this revised approach to principles that he and other great clinicians have been teaching for years. In "Five Steps" Matt addresses correct hand, leg, and seat position, as well as, when and how to know that your horse is responding correctly. Too often riders go through the motions without knowing exactly when and why their horse did things. Matt uses his methods to enable riders to advance in their ability with the horse. Aside from being a successful trainer of horses and people, Matt also spends part of the year as a Special Education Program Coordinator. He believes that this classroom experience is what sets him apart from other horsemanship instructors. Instruction is taught to many different learning abilities and styles. Matt’s background provides the much needed patience to accomplish great things with horses. Much like his experience in the classroom, Matt has also been successful in the show pen. He has shown many different breeds in a variety of classes. He has been successful in each. For Matt, success in the show pen and his clinics comes because of a supportive and loving family. Matt is supported by his wife, Jennifer, and his two daughters. They often travel with him or will be assisting you when you call to book a clinic or lesson. Because of his care for the horse and human relationship, Matt works hard to enable people get more out of their horses with less effort and more understanding. To read testimonials about Matt's training and ability click here. 2001-2008 Trainer of 6 Rodeo Queen contestants - 5 Queens, 1 runner up, 3 California 1 Nevada State Rodeo Queen qualifiers, 1 - 4th runner up at California State, 1 NRQ Horsemanship win. 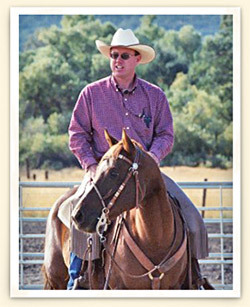 2003-2007 Featured clinician, Back Country Horsemen of California's State Rendezvous. 2003-2005 Judge - Arena & Trail, Antelope Valley Desert Riders Horse Show Series. 2005 Judge - Arena, 4-H regional horse show.